“It all starts with the desire to say no: when American artist Mark Rothko had completed a cycle of paintings for the Four Seasons Restaurant in New York, he decided to refuse their exhibition after a personal crisis. He saw this restaurant’s commitment as the epitome of a new bulimia of images. Nowadays, this cycle of monumental canvases forms the nucleus of the cathedralesque Tate Modern Gallery in London. The Four Seasons Restaurant is a reference to Rothko’s late masterpiece: the audience is confronted by a gigantic black rectangle that hides the entire stage, accompanied by ear-splitting music and fragmentary texts – an overwhelming technical arrangement that overpowers the senses. Mass, adoration, idolatry figure alongside fundamental concepts of religion, philosophy and nihilism in director Castellucci’s work, who started out as a visual artist. The blank white stage the woman had been on disappeared behind black curtains. With the music from the black hole and the rhythmic veiling of the white, watching the stage being engulfed put me in a trance. 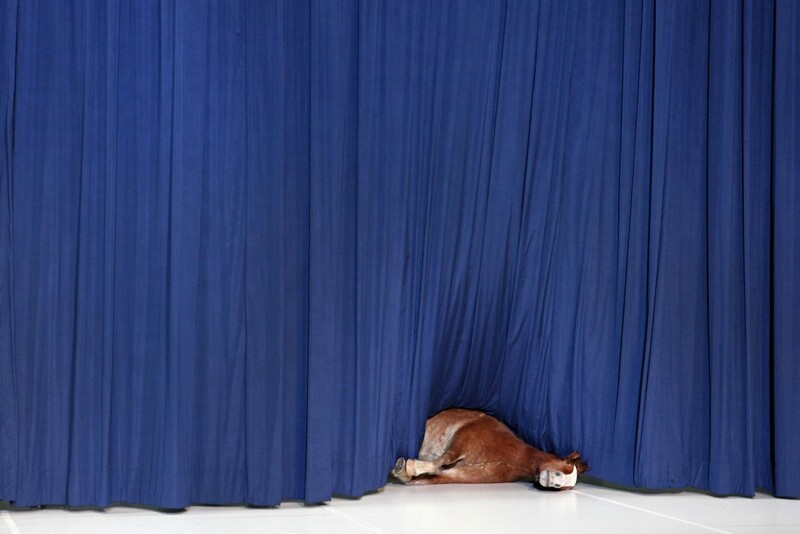 The downstage curtain slowly dragged upstage toward the back revealing a dead horse, laying on its side. No sooner had the horse been revealed but the curtain dragged forward to cover it again. The sounds from the black hole continued to play. The curtain lifted to a wall of gushing water in a tank but soon discovered to be a deluge of small black particles being blown wildly about. After several minutes I noticed a woman sitting in the midst of it all, waving a flag. 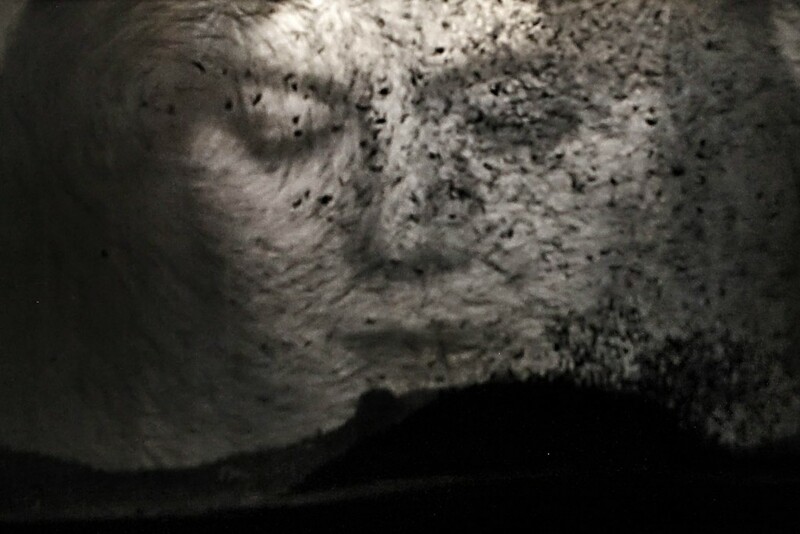 As the particles began to rest and become still, the face of a woman, as large as the stage could be seen. She was Mother Mary drawn on the back wall. Just then, the naked young women came onto the stage and rushed toward the mother, reaching for her mouth as she looked down to them. Photo source for horse image and last image found here. Photo source for "birthing" image found here.